Auto-level image using local histogram. Return greyscale local autolevel of an image. Local bottom-hat of an image. Equalize image using local histogram. Return local gradient of an image (i.e. Return local maximum of an image. Return local mean of an image. Return local geometric mean of an image. Apply a flat kernel bilateral filter. Return image subtracted from its local mean. Return local minimum of an image. Return local mode of an image. Enhance contrast of an image. Return the local number (population) of pixels. Return the local sum of pixels. Local threshold of an image. Local top-hat of an image. Local Otsu’s threshold value for each pixel. 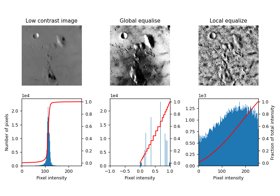 Return local percentile of an image. Majority filter assign to each pixel the most occuring value within its neighborhood. This filter locally stretches the histogram of greyvalues to cover the entire range of values from “white” to “black”. The neighborhood expressed as a 2-D array of 1’s and 0’s. Mask array that defines (>0) area of the image included in the local neighborhood. If None, the complete image is used (default). Offset added to the structuring element center point. Shift is bounded to the structuring element sizes (center must be inside the given structuring element). Only greyvalues between percentiles [p0, p1] are considered in the filter. Define the [p0, p1] percentile interval to be considered for computing the value. This filter computes the morphological closing of the image and then subtracts the result from the original image. Return local gradient of an image (i.e. local maximum - local minimum). The lower algorithm complexity makes skimage.filters.rank.maximum more efficient for larger images and structuring elements. Gonzalez, R. C. and Wood, R. E. “Digital Image Processing (3rd Edition).” Prentice-Hall Inc, 2006. 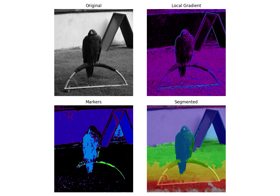 This is an edge-preserving and noise reducing denoising filter. It averages pixels based on their spatial closeness and radiometric similarity. Spatial closeness is measured by considering only the local pixel neighborhood given by a structuring element. 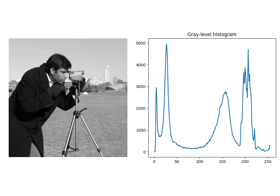 Radiometric similarity is defined by the greylevel interval [g-s0, g+s1] where g is the current pixel greylevel. Only pixels belonging to the structuring element and having a greylevel inside this interval are averaged. Define the [s0, s1] interval around the greyvalue of the center pixel to be considered for computing the value. The neighborhood expressed as a 2-D array of 1’s and 0’s. If None, a full square of size 3 is used. 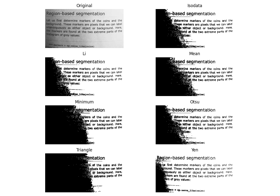 Implementation of a median filtering which handles images with floating precision. The lower algorithm complexity makes skimage.filters.rank.minimum more efficient for larger images and structuring elements. The mode is the value that appears most often in the local histogram. This replaces each pixel by the local maximum if the pixel greyvalue is closer to the local maximum than the local minimum. Otherwise it is replaced by the local minimum. The result of the local enhance_contrast. The number of pixels is defined as the number of pixels which are included in the structuring element and the mask. The number of pixels is defined as the number of pixels which are included in the structuring element and the mask. 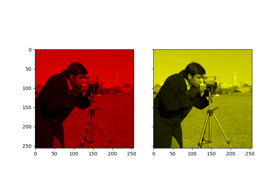 Additionally pixels must have a greylevel inside the interval [g-s0, g+s1] where g is the greyvalue of the center pixel. Note that the sum may overflow depending on the data type of the input array. Spatial closeness is measured by considering only the local pixel neighborhood given by a structuring element (selem). Only pixels belonging to the structuring element AND having a greylevel inside this interval are summed. The resulting binary mask is True if the greyvalue of the center pixel is greater than the local mean. This filter computes the morphological opening of the image and then subtracts the result from the original image. N. Hashimoto et al. 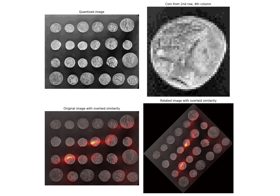 Referenceless image quality evaluation for whole slide imaging. J Pathol Inform 2012;3:9. The entropy is computed using base 2 logarithm i.e. the filter returns the minimum number of bits needed to encode the local greylevel distribution. If None, a new array will be allocated. Returns the value of the p0 lower percentile of the local greyvalue distribution. The number of histogram bins. Will default to image.max() + 1 if None is passed. 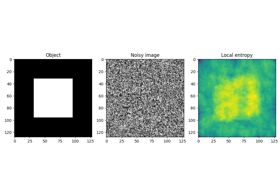 the dimensions of the input image and N is n_bins or image.max() + 1 if no value is provided as a parameter. 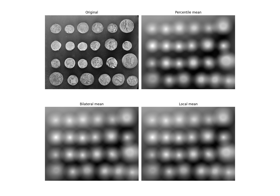 Effectively, each pixel is a N-D feature vector that is the histogram. The sum of the elements in the feature vector will be 1, unless no pixels in the window were covered by both selem and mask, in which case all elements will be 0. Image array (uint8, uint16 array).